Dr.Vanja Vučičević Boras at Croatia and colleagues have reported a rare case of TB Oral Cavity presenting as Painless Ulcer tongue. The case has been published in the journal Acta stomatologica, and it describes an extremely rare oral lesion as a result of primary pulmonary tuberculosis. Despite advances in diagnostic and therapeutic opportunities, tuberculosis (TB) still remains one of the leading causes of death around the world. The World Health Organization (WHO) reported the incidence of 9.6 million global cases of TB in 2014, predominantly in South-East Asia and Western Pacific nations. In the present case, a 68-year-old male patient was referred to the Department of Oral Medicine, School of Dental Medicine, the University of Zagreb with complaints of painless tongue ulceration. It was a refractory painless ulceration at the ventral surface of the tongue. His detailed medical history was taken which was followed by a clinical examination of the oral mucosa and palpation of regional lymph nodes. The examination revealed ulceration on the patient’s ventrolateral surface of the tongue which was approximately two centimetres in diameter. On palpation, regional lymph nodes did not reveal enlargement. The toluidine blue test of the suspected lesion was performed at each control examination. His biopsy samples for histopathologic diagnosis were taken three times. The analysis of the first biopsy sample for histopathology revealed a non-specific inflammation whereas the second biopsy revealed a caseous necrosis without positive Ziehl-Neelsen staining and the third biopsy revealed a granulomatous inflammation which was highly suspicious of sarcoidosis. The patient was hospitalized and he underwent a complete physical examination, and laboratory and radiological diagnostics. His physical chest examination revealed bilaterally coarse crepitations and laboratory findings of his complete blood count revealed normocytic anaemia of chronic disease. The radiographic examination of lungs showed multiple small nodules bilaterally and positive direct sputum smear. The patient was treated by a combination of four standard antituberculosis agents: isoniazid, rifampicin, ethambutol and pyrazinamide. 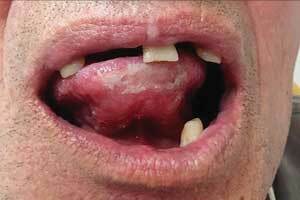 After the treatment, his ulcerated lesion of the tongue rapidly improved along with pulmonary status. Although there has been an increase in the incidence of extrapulmonary TB due to rare clinical presentations, it is still an underdiagnosed entity. 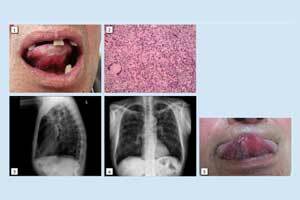 This case report describes a painless oral ulcer as a secondary lesion of active primary lung TB without other specific pulmonary symptoms.